You would think I would have learned from the last two food blogger potlucks I attended, but no. Another potluck was held on Sunday, and I really thought that this time I’d just nibble on a few things and not leave completely stuffed. The theme for this potluck was beer, and the event was held at 512 Brewery. So, not only did I lose track of how many incredible dishes I sampled, I also sampled several delicious beers. More info about the potluck can be found at Foodie is the New Forty and at Relish Austin. I had a couple of ideas for dishes made with beer, and one was savory and the other was sweet. I’ll post about the sweet one soon. First, I wanted to try braising chicken in beer, and I imagined the flavorful, slow-cooked meat and vegetables would work well in a pot-pie kind of dish. I mostly followed the recipe for Ina’s Chicken Stew with Biscuits from Barefoot Contessa Family Style after the chicken was cooked. This was an experiment because I had never before braised chicken in beer and wasn’t sure if that would incorporate too much beeriness or not enough or if the chicken meat would be an odd brownish color. I decided to give it a whirl and find out the answers. I wanted to be sure that I was in fact braising and not stewing or roasting, so I first referenced Ruhlman’s The Elements of Cooking . After a quick look at his definition, I knew that I needed to lightly coat the chicken pieces with flour, briefly sear the pieces, and then add enough liquid so that it would not evaporate as the chicken cooked but not so much that the chicken would be submerged. I used four bone-in breasts and two thighs, and in the roasting pan I used, two and a half 12 ounce bottles of Boulevard Oktoberfest beer was the right amount. After searing the chicken, I added small potatoes, whole shallots, and big chunks of carrots and celery before pouring in the beer and covering the pan. Also, from Elements, I learned that braising should happen at a temperature no higher than 300 degrees F, and that’s the temperature at which I set my oven. After an hour and a half, the chicken was cooked through and had reached 165 degrees F. The next step for a successful braise is to let the meat cool in the braising liquid. This is why I started this process early. I left everything in the dish with the braising liquid and placed it in the refrigerator overnight. The next day, I removed the meat from the bones and chopped the vegetables into small pieces for the stew. Good news: the chicken meat had not turned an ugly brown at all, and it was as tender as can be. For the stew, the sauce was made with five cups of stock. Again, I wasn’t sure if the braising liquid, which was all beer, would be too beery for the sauce. It had been flavored with the chicken and vegetables while in the oven, but I decided to use only four cups of it and one cup of plain chicken stock so as to hedge my bet. Some finely chopped shallots were browned in 12 tablespoons of butter with some finely chopped sage and rosemary, and then three-fourths of a cup of flour was added to form a roux. The stock and braising liquid were stirred into the roux to form the sauce, and after thickening, one quarter cup of cream was added as well. The chicken, potatoes, carrots, and celery were added with a package of frozen peas and some chopped parsley. Once well mixed, that all went into a baking dish which was placed in a 375 degree F oven for 15 minutes. 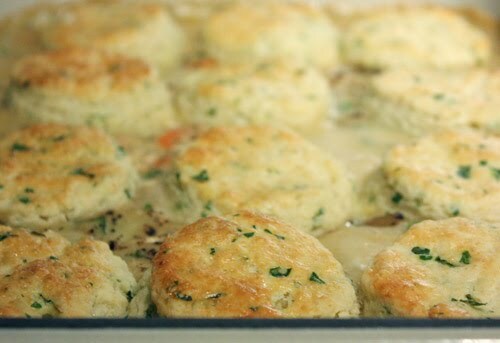 Then, the stew was removed from the oven and topped with biscuits that were made with parsley in the dough. After brushing an egg wash on the biscuits, the stew went back into the oven for another 30 minutes. After all my worrying about the dish tasting too beery, in the end, the flavor from the beer was actually very subtle. I could smell the beer in the dish, and the flavor was there but it was nicely mixed with the chicken and vegetables and biscuits and herbs. This whole process may seem labor-intensive, but each step was very easy. The original recipe in Barefoot Contessa Family Style suggests quickly roasting chicken breasts and using them as soon as they are cool enough to handle. However, if you’d like to try a beer-themed meal, I highly recommend a slow braise with a medium-bodied brew and letting the meat cool in the pan. It smells amazing as it cooks, and the texture of the meat is as good as it gets. These biscuit topped stews really intrigue me. I am going to have to try one. 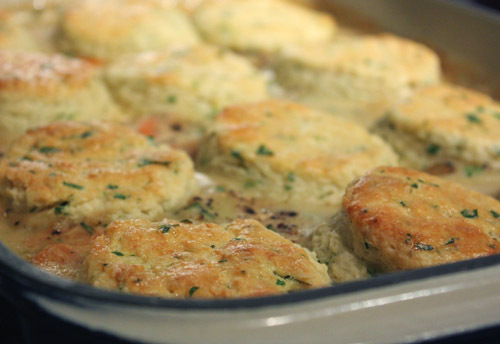 Well...hello there chicken stew with biscuits. Where have you been all my life? Must. Have. Now. lol. Hi Lisa, how are you ? your biscuit look great. ohh. i love biscuits so much! this looks like the perfect rainy fall day meal! Lisa, these biscuits look heavenly...a real treat for any day! Sounds very comforting, food for the soul. I would love to try these cookies, sounds interesting and tasty to me! Lisa your dish was delicious! Great choice. ok...so glad you posted this recipe...this was one of our favorites from the potluck. houston has only asked half a dozen times already, 'when are you gonna make the chicken biscuit thing from the potluck?' i'll have to somehow secure this recipe from you...or the internets...or something. really, this was just wonderful! Comfort food at its finest. Looks beautiful! Stephanie: I just found the Ina recipe on the FoodNetwork site, so I updated the post with the link. I don't think she adds potatoes, but I included them in my braise and then chopped them smaller to add into the stew. I like your biscuits topping. What a delicious dish. oh wow this looks awesome and the cookies below oh yeah! WOOOOOOOOW!!! THIS IS SO UNIQUE and YUMMY LOOKING!!!! I'm mad hungry now! This looks way better than the usual ol' pot pie. Of course, I would be bad and steal all the biscuits off the top when nobody was looking. beer helps you forget everything and I love cooking with beer especially the great seasonal beers this time of year. I normally do a beef braised beer dish but now you have my head spinning with chicken. Awesome execution and I want a pot luck. Great way to try so many different things. The stew sounds so wonderful with the delicious biscuit topping! I had never before cooked meat in bear until the assignment for the royal foodie joust and I just loved it! Your dish looks gorgeous! As soon as I saw the photo of your recipe, I immediately thought this was the Ina's recipe-It was but, you were able to bring this dish to a new level. Awesome! How cool to be able to have a food bloggers pot luck! I am so envious. Everything in this post look amazing and it is almost lunch time. My stomach is starting to growl! This whole dish looks truly wonderful!! I jusyt love every flavour of it!! A Grand dish!! Wow! I can't wait to try this! I love finding new chicken recipes and I love cooking with beer. 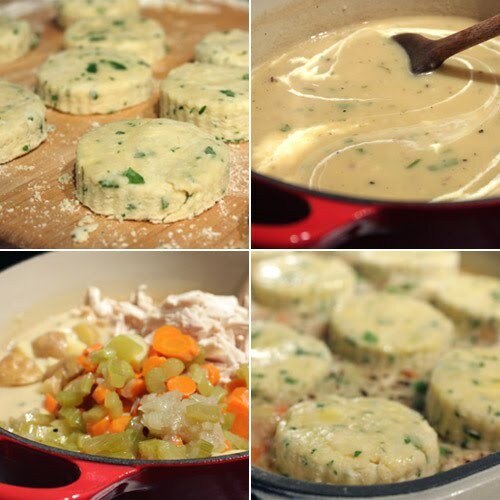 Your biscuits look amazing...like they would melt in your mouth! Another one for my delicious cookbook! 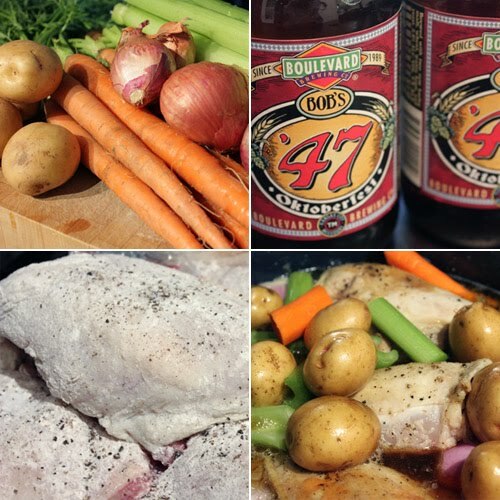 What a nice recipe, love the beer braising! Those biscuits would be the end of me! And the gravy- yum. Great description as you went along- this recipe is definitely a keeper. This looks excellent! I love the idea of the beer and those biscuits! They seal the deal for me. ooh delicious! the biscuits look so light and fluffy! sounds perfect for fall and winter. Oh wow, I didn't realize you were in Austin. Love your blog!